It’s hard to find an analysis of the mining and minerals sector that offers even a glimpse of a brighter future. A new report by consultants McKinsey & Company takes a fresh look at the industry and finds much of today’s doom and gloom is misplaced. The study suggests that the steadily deteriorating quality of accessible resources combined with the current cuts in new mine investment, will likely squeeze supply in the face of steady, albeit slow, demand growth, causing prices to rebound. 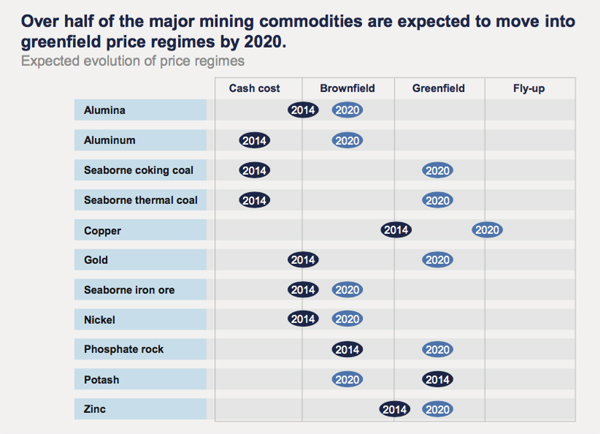 Geological shortage is likely to be a stronger determinant of future prices than demand. That’s due to grade erosion (particularly in copper, gold and phosphate rock), depletion on a mine-by-mine basis combined with declining resource levels and delays in new projects which raises the likelihood of increasingly severe shortages. Geological factors saw cost inflation for marginal copper, iron ore and potash producers rise 20% from 2000–2013. Lower diesel prices and depreciating currencies will keep external inflation low but deteriorating mining conditions (including declining ore grades, deeper shafts, higher stripping ratios and longer hauling distances) will keep overall inflation humming along at 4%–7% going forward. Cash cost – price levels are close to the cash cost of the marginal producer, and there is minimal incentive to invest. Brownfield inducement pricing – high enough to justify extending the life of existing mines. Greenfield inducement pricing – would justify investing in new greenfield projects. Fly-up pricing – demand grows so fast and capacity utilization is so tight that prices temporarily soar well above levels dictated by the cost curve. Mapping the price regimes for each commodity over the past 20 years, as well as the price premiums associated with those regimes (that is, the commodity’s price minus the cost of the marginal producer), gives a clear picture of what lies ahead say the authors and offer real countercyclical investment opportunities. This table sums up the outlook for each commodity and shows even the most downtrodden commodities like coal, iron ore and nickel have sunny outlooks, while copper could soar. When all drivers are considered, say the authors of the report, the analysis suggest that after a 6% annual decline between 2011 and 2014, industry-wide mining revenues could grow at around 4%–6% over the next decade. Not the go-go days of the China-induced supercycle by any means, but a convincing argument for more bullishness for sure. Click here for a copy of the report that includes further analysis and an action plan for mining companies looking to diversify and acquire.